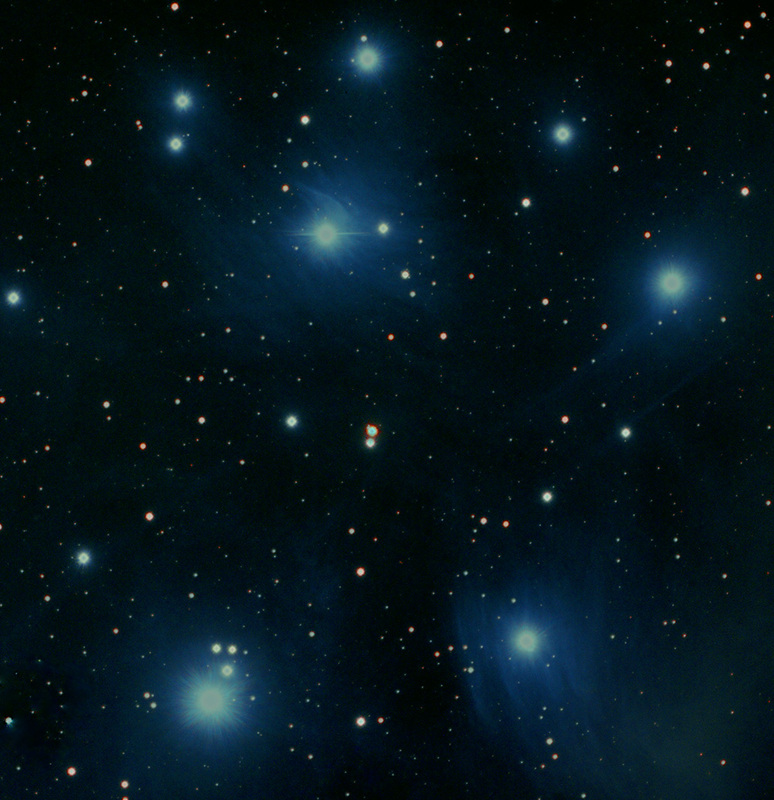 One of the most beautiful sights of the summer skies is the Pleiades star cluster, also known as the Seven Sisters. The cluster is known in Japan as “Subaru”, hence the grill badge on cars of the eponymous manufacturer. This entry was written by whyevolutionistrue and posted on December 25, 2018 at 7:30 am and filed under astronomy, photography. Bookmark the permalink. Follow any comments here with the RSS feed for this post. Both comments and trackbacks are currently closed. That’s the summer in Australia and the rest of the southern hemisphere. When I first started walking the mountains, I learned to count the Pleiades which I could distinguish to get an idea of how cold it was going to be tonight. Four Pleiads or fewer meant there was enough thin, high cloud that it wasn’t going to be much below freezing; five or six would mean a good freezing night and hard snow and ice in the morning ; seven or more and it is going to be a hard night and absolutely brassic if I’d only got my three-season bag in the rucksack. But that would be OK because it encourages you to get moving well before dawn to get the best of the snow. Ok, so I’ve always wondered–why are there only six stars on the Subaru badge? There are many more than 7 stars in the cluster, but most are below naked eye visibility. The 7th brightest is Pleione and is not so easy to see under light polluted skies. I believe that it is a binary ‘shell star’ with an unstable brightness and my have faded somewhat since ancient times. Its rotation speed is so high that it is close to being disrupted by centrifugal force and is highly elliptical in shape. As it is difficult to see, Subaru must have decided that 6 stars were enough for their badge. Thanks for the explanation, as I was wondering why it looked like 8 or more. Nice photo. Just in case you were thinking about buying one in the U.S. They donate $250 to the ASPCA for every Subaru purchased. Where should one send photos for the ‘Wildlife’ pages? google Jerry Coyne. Go to the Chicago page and get his email there. Nice! And interesting too to learn how these pictures may be taken. I remember this cluster well as a youngster. It was one of the first objects that i observed with my first telescope.